Going into the year the 1A Boys race was filled with question marks. For the first time since 2013, we did not have a returning runner in 1A that ran 14:30 the year prior. The fans came in expecting a battle between seniors Christopher Collet of Seneca and Garrett Dixon of Monticello and it turned out to be that way here. The two went through the first mile around 4:50 and the second mile in 9:50. In the next half-mile, Dixon would fade after his surges to rid Collet failed. Collet ended up putting 11 seconds on Dixon in the last half mile to take home his first state title and winning in 14:45. Dixon settled for the runner-up spot in 14:56. The battle for third through fifth was quite a distance behind for throughout the race. Robinson junior Negus Bogard held on for third in 15:06. Senior Jackson Stewart of Decatur (St. Teresa) took fourth in 15:07. Junior Dawson Smith of Rock Falls held on strong against several foes to close out the top five in 15:10. The battle for the three-team trophies had a different outcome than some expected. #1 Clifton Central was the favorite to walk away with the team title, but many thought it would be a close battle between them and #2 Monticello. Unfortunately, the Sages had to settle for third. That wasn't the case with the Comets easily defeating the Owls by 50 points. They were challenged by #3 Elmwood only beating them by four points to take home the program's first title. 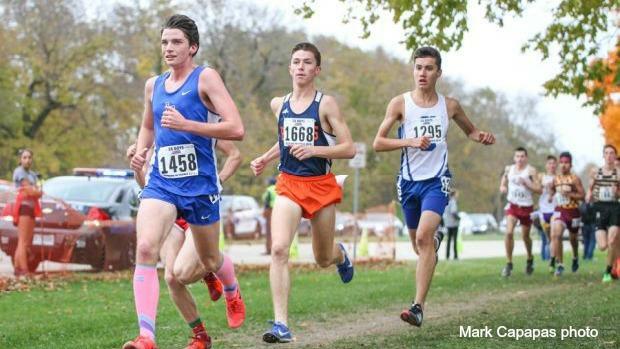 Coming into the year there were only two boys in the individual race for and their names were senior Mathias Powell of Mahomet-Seymour and junior Adam Gilbreath-Glaub of Metamora. After an early-season illness to Gilbreath-Glaub, it opened the door for Powell to be the clear favorite for the title and as soon as the race started it was academic. Powell stayed back with the pack for just a mile that rolled through in 4:50. Soon after things began to change when he shifted gears and pulled away from the field to win in a personal best 14:31. Runner-up junior Nathan Schmitt of Lake Forest took second in 14:47. The standout senior admitted to not knowing much about the new classification coming into the season. However, he was grateful for the placement as he held off junior Anthony Farmer of Burlington Central, junior Charlie Smith of Antioch, and senior Nick Doud of Bloomington. These five were the only ones to break 15:00. #1 Chatham-Glenwood survived one of the highest winning point finals in recent history to down #2 Springfield 153-161. Bloomington rounded out the team trophy winners in third with a total of 167. The team race was what was expected with #1 Wheaton Warrenville South coming out on top with a score of 116 points. #3 Hersey came in second place with a score of 156 points and #6 Neuqua Valley surprised many by taking third with a total of 159 points.